Our Most Challenging, Rewarding Expedition! Our 2 month expedition is by far our biggest experience. It means you can create deeper connections, achieve bigger rewards, enjoy more adventures – with complete immersion into Fijian culture. This expedition is for those with a positive mindset, personal drive and passionate commitment to making a real difference in Fiji. Joining a 2 month team means you’ll live within a remote village & volunteer in the local school for 7 weeks. Plus 7 days in a beach resort across the briefing & R&R phases of the expedition and 7 weekend adventures, from guided jungle treks, to visiting remote beaches or waterfalls. If you are the type of person who values making the most of every opportunity to challenge yourself then this is the expedition for you. A Think Pacific 2 month expedition is a once in a lifetime adventure that will stay with you forever. 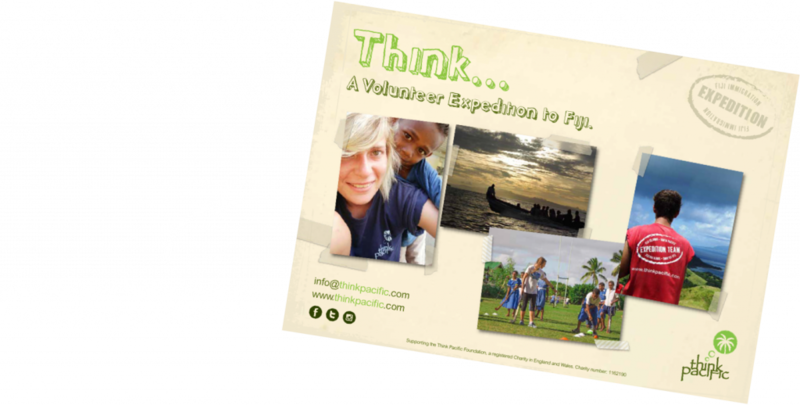 With a team of up to 20 fellow like-minded passion volunteers you will contribute to education, youth and sports volunteer projects, which are achieving dramatic results in partnership with the Fijian government. Whilst experiencing the island lifestyle, you’ll learn Fijian culture and customs, gain a Fijian family and make friends for life as you experience this South Pacific paradise through the eyes of the local people. All meals during your briefing, all meals for 7 weeks staying with your Fijian village family and breakfast and evening meals during your final days of R&R at beach resorts. Your project donation of £600 towards the youth development goals in Fiji (which is used to purchase educational and sports equipment, fund scholarships and training for local people and build village facilities and school classrooms).